A wood burner can be an attractive, safe and cost effective alternative to central heating – provided you have the right installation and live in an area where getting hold of quality wood isn’t a problem. Initial outlay can be expensive – an average wood burner will set you back at least £1,000, while high quality one is more likely to double that price – but with heating costs eternally rising the long term benefits can be significant. Those of us old enough or fortunate enough to remember the coal range (oh, to still have an Aga in the kitchen – or even to have a kitchen big enough to fit an Aga into!) will be familiar with the kind of heat produced by the modern wood burner. Its iron construction and pipe work means you can farm a lot of heat from a single burn, often enough to keep the chill out of the air overnight and into the next morning. Installation must be done by a qualified professional – or inspected by a council buildings inspector once finished, if you do it on your own. If you install a wood burner in an existing fireplace you may do so without planning permission, fitting the flue into the gap using a flue cap (a plate that allows you to safely connect a small flue outlet into the larger space of the average chimney); if you install a wood burner in a property with no existing flue service, you will have to apply for planning permission and have the flue run through a wall. You shouldn’t have trouble with the planning stage of your installation, if that’s what you need to do – you can often install a flue under Permitted Development, particularly where it is done to make your energy consumption less horrific. Be aware that failure to have a self-installed wood burner properly inspected is extremely dangerous. An imperfect seal on your flue can result in carbon monoxide poisoning. UK building regulations now require that a CO alarm is fitted in conjunction with any wood burning stove – but even with the alarm, you don’t want to take the chance. Get your work signed off by the buildings inspector before you fire it up. If you aren’t lucky enough to live in an area where quality wood is easily available, you may wish to consider installing a dual fuel stove. Dual fuel wood burners, also referred to as multi fuel stoves, allow you to heat your home using the flame from a gas connection as well as from wood – so you can enjoy the benefit of your installation even when you can’t find affordable wood. The quality of the wood you use has a direct impact on the life and efficiency of your stove. Young wood is too full of sap, which will coat the interior of the stove – ruining its beauty and potentially clogging up ventilation sites. Use only older seasoned wood, and take the advice of your stove manufacturer on the right species of tree wood to use. 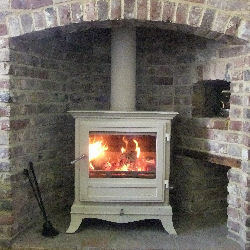 Chesney’s – a manufacturer of beautiful wood burning and multi fuel stoves. 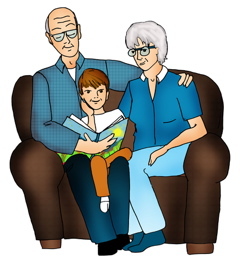 Installing Solid Fuel Stoves – a leaflet produced by East Herts CC explaining building regs and wood burners.